Once a hunting ground for a local ruler, the Bandipur National Park today is an important part of the wildlife protection efforts in South India. Located in southern Karnataka, the park actively participates in Project Tiger and has an impressive population of Bengal tigers. Known for its greenery, the wildlife reserve is flanked by many rivers and seasonal streams, adding to its overall beauty. Apart from tigers, the park is home to Asiatic elephants and many other wildlife species like dhole, deer, hornbill, gaur, sloth bear, wild boar, python and crocodiles. Many of them are counted as threatened species. In addition, the park is well - known for the presence of sandalwood trees. Many other types of trees like teak, Indian laurel and clumping bamboo can be found here. Trees bearing flowers and fruits too constitute towards the magnificence of the area. A hill called Himavad Gopalaswamy Betta inside the park and is known for being surrounded by clouds and mist forever. The hill has an old fort which also accommodates the Gopalaswamy Temple. 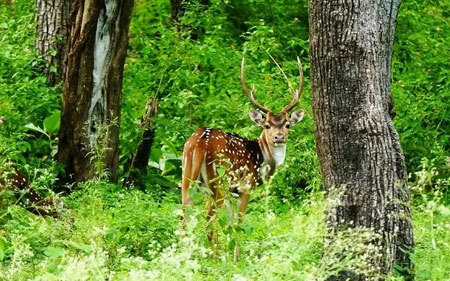 Bandipur National Park is deservingly called the paradise for the nature and wildlife lovers. It is the open forest area of the park that makes accessing animals easy. Jeep safaris and elephant safaris are the best ways to explore the park. Group treks headed by expert guides too can be joined.